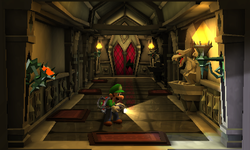 The West Corridor is a location in Treacherous Mansion in Luigi's Mansion: Dark Moon. Located on the second floor and at the west side of the mansion, this corridor provides the main entrances to the Aviation Exhibit, Archives and Space Exhibit, as well as a place to look out through a window onto the Terrace. There are only a few objects in the West Corridor. There are a couple of gargoyles the player can hit with the Strobulb for coins, the aforementioned window used to look out onto the Terrace and a door leading to the Inner Courtyard, but there is nothing else of note in the room. In A Train to Catch, the West Corridor is used by Luigi as a way to access the Aviation Exhibit, Archives and Space Exhibit. When the Strong Poltergeist later escapes, the door to the Space Exhibit in the West Corridor is made invisible via Spirit Balls and can be revealed by the Dark Light to make it usable again. In Paranormal Chaos, the West Corridor is used to reach the Space Exhibit, which is now infested with ghosts. Additionally, the north window cannot be looked out of due to the random earthquakes that fling Luigi back when he tries. In Terrifying Invasion, West Corridor is one of the rooms that might be infested with ghosts. If it is, Luigi will face Sneakers here and must find their location by using their reflection in the polished floor. This page was last edited on September 24, 2017, at 04:00.